^ Spinoza on Philosophy and Religion: The Averroistic Sources (PDF). （原始内容 (PDF)存档于2013-12-03）. ^ 2.0 2.1 Averroës (Ibn Rushd) > By Individual Philosopher > Philosophy. Philosophybasics.com. [2012-10-13]. ^ 3.0 3.1 3.2 Sonneborn, Liz. 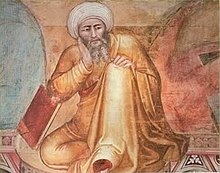 Averroes (Ibn Rushd): Muslim Scholar, Philosopher, and Physician of the Twelfth Century. The Rosen Publishing Group. 2006: 89 [November 3, 2012]. ISBN 1404205144. ^ Ernest Renan, Averroès et l'Averroïsme: essai historique, 1882. ^ H. Chad Hillier (2006). Averroes (Averroes) (1126–1198 CE), Internet Encyclopedia of Philosophy. ^ Seyyed Hossein Nasr and Oliver Leaman (1996), History of Islamic Philosophy, p. 314, Routledge, ISBN 0-415-13159-6. ^ Duignan, Brian. Medieval Philosophy: From 500 to 1500 Ce. The Rosen Publishing Group. 2010: 102 [November 7, 2012]. ISBN 1615302441. ^ Richard C. Taylor. Richard C. Taylor; Peter Adamson, 编. The Cambridge Companion to Arabic Philosophy. Cambridge University Press. 2005: 181. ISBN 978-0521520690. ^ 本條目部分或全部内容出自公有领域： Chisholm, Hugh (编). Anatoli, Jacob. 大英百科全書 第十一版. 劍橋大學出版社. 1911年. ^ ملخص لأعمال ابن زهر وابن رشد الطبية. ^ IBN RUSHD: AVERROES PB - Urvoy. 1991-04-25 [2012-10-13]. ^ Rushdī Rāshid; Régis Morelon. Encyclopedia of the History of Arabic Science. [2012-10-13]. ^ Ibn Rushd [Internet Encyclopedia of Philosophy]. Iep.utm.edu. 2010-01-05 [2012-10-13]. ^ Hyman, Arthur (编). Philosophy in the Middle Ages: The Christian, Islamic, and Jewish Traditions 3rd. Hackett Publishing Co. 2010: 285. ISBN 978-1-60384-208-2. ^ McGinnis, Jon (编). Classical Arabic Philosophy: An Anthology of Sources. Hackett Pub Co Inc. 2007: 295. ISBN 978-0-87220-871-1. ^ Black, Antony. The History of Islamic Political Thought 2nd. Edinburgh University Press. 2011: 122. ISBN 978-0-7486-3987-8. ^ Robert Pasnau. The Islamic Scholar Who Gave Us Modern Philosophy. Humanities. Nov–Dec 2011, 32 (6). ^ Kadri, Sadakat. Heaven on Earth: A Journey Through Shari'a Law from the Deserts of Ancient Arabia .... macmillan. 2012: 118–9. ISBN 9780099523277. ^ For al-Ghazali's argument see The Incoherence of the Philosophers. Translated by Michael E. Marmura. 2nd ed, Provo Utah, 2000, pp.116-7. ^ H-Net Reviews. H-net.org. [2012-10-13]. ^ A.C. Brown, Jonathan. Misquoting Muhammad: The Challenge and Choices of Interpreting the Prophet's Legacy. Oneworld Publications. 2014: 12. ISBN 978-1780744209. Thomas Aquinas admitted relying heavily on Averroes to understand Aristotle.